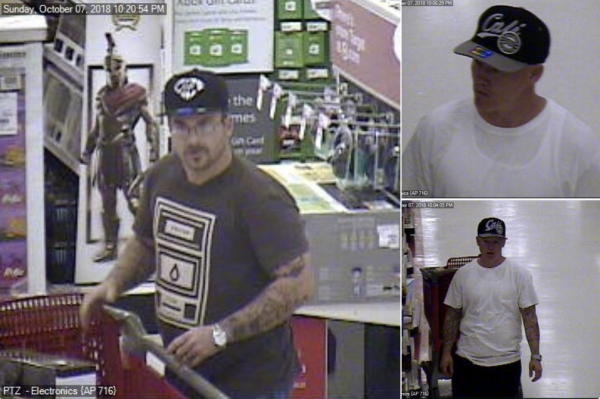 A pair of thieves made a break out the emergency exit of the San Luis Obispo Target store Sunday night while stealing $1,000 worth of electronics, SLO Police Chief Deanna Cantrell announced in a tweet. At about 11 p.m., the thieves grabbed the electronics, ran out the rear emergency exit doors and were last seen driving off in a white SUV, Cantrell stated. Surveillance images Cantrell published show the suspects inside the store with a shopping cart holding at least one item. Both suspects are white men who were wearing hats and have tattoos on their arms, the surveillance images appear to show. San Luis Obispo police ask anyone who has information about the theft to call Officer Orozco at (805) 781-8035. Next → Next post: Who is AG mayor candidate Caren Ray working for?